Story by Milli Thornton. Photos Copyright © Brian Williams. WHILE VISITING HENDERSONVILLE, south of Asheville, North Carolina, we naturally wanted to climb the famous Chimney Rock. 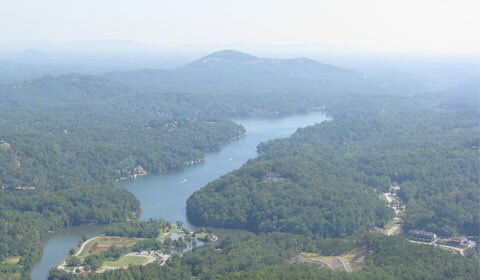 Well, you can’t stand on top of Chimney Rock without noticing Lake Lure. And once you see it from above in all its glory, you want to see it up close and personal. That’s not hard to do once you come down from the Rock. 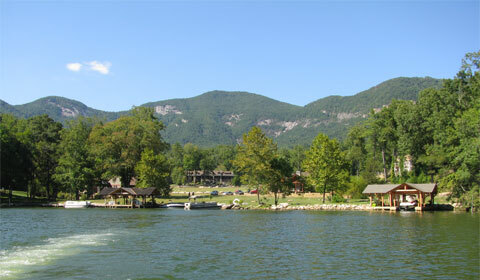 The lake is just a short drive through scenic Hickory Nut Gorge, a popular tourist and biker watering hole. Nestled in the gorge is the village of Bat Cave, named after Bat Cave Mountain (and, you guessed it, a local cave inhabited by a multitude of bats). You can stop for coffee in Bat Cave and be at the lake a few minutes later. The skies were hazy during our entire stay in the area, and the day we saw the lake from Chimney Rock it looked romantic in its smoky allure. I was glad that the skies were a lot clearer the day we went back to visit the lake itself. This made pictures of the shoreline crisper, the one below being my favorite. The landscape and colors in this scene, to me, have “North Carolina” written all over them. 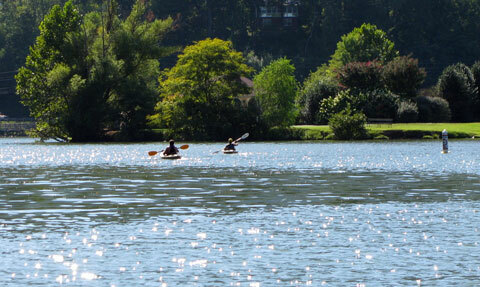 Another favorite pic was when Brian captured two kayakers paddling serenely, the water sparkling all around them. It was our last day in the area and this moment was one of the many things about Lake Lure that made me regret our imminent departure. Going home to suburban Ohio did not sound like the plan I wanted! Brian took many of these photos from the deck of a covered pontoon boat. The marina provides hourly boat tours for $14 per adult—and you really can’t do the lake without taking this ride. It’s simply spectacular, and the captain has a spiel for every point of interest around the lake. But it was the waters of the cove that our captain got the most mileage out of. 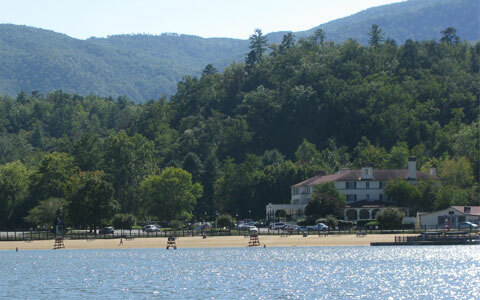 The movie was filmed on location at Lake Lure and also Mountain Lake near Pembroke, Virginia. According to local legend, the famous scene where Patrick Swayze and Jennifer Grey practice their dance lifts in the lake took place when the waters were quite frigid—but the stars were troopers about the challenging conditions. The goose bumps that started as we sailed the Dirty Dancing cove continued to build as the sights got more incredible. There were so many million dollar and multi-million dollar homes along the shoreline it was hard to decide which one to include in this story. I chose the one below because of its brooding appeal. This home is a little too Gothic for my tastes . . . but if I was forced to live there you wouldn’t hear me complain! Note the massive boat house with sun deck up top. 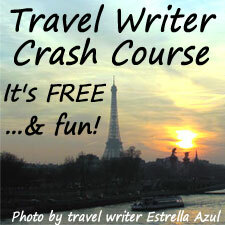 Check out the real estate - and bring your millions! Our captain was a born humorist and I’m guessing he inserted his own (sometimes corny) jokes into the standard spiel. This was all part of the relaxing exercise of being piloted around the lake on a blissful afternoon—the soporific effects of the sun combined with the mesmerizing sounds of the water could make you want to lie down for a snooze. We needed a good joke every so often to keep us alert. There was more fascinating history too. The lonely chimney in the scene below was part of a luxury home until it burned to the ground. Our captain had anecdotes about the challenges the fire department faces in gaining access to homes built on some of the steeper slopes of the lake, and sometimes at the end of one-lane roads that wind through thick forest. The dining experience includes fine dining in the Veranda Restaurant, casual dining at Beachside Grill, drinks and hors d’oeuvres in the The Moose and Goose Lounge and, for $55 per person, the Sunset Dinner Cruise. We were in North Carolina in late September, so the beach was closed for the season. But the weather was still gloriously warm and the beach still looked incredibly inviting. 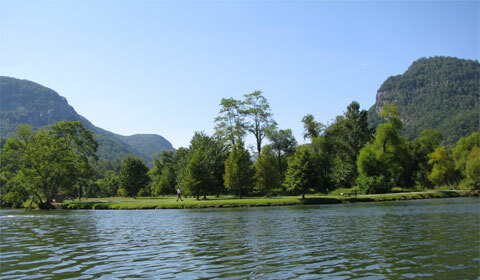 It’s not hard to imagine what Lake Lure is like in peak season, with the beach packed to the gills and nowhere to park. But fighting the crowds could be well worth it—this place has so much beauty to offer, as well as the fun summer water activities. One of the final sights as we pulled into the marina brought us full circle: seeing Chimney Rock from the lake. Despite the powerful sense of elevation and the commanding views you get while standing on the Rock, from the lake it looks like a bump on the side of the mountain with the American flag stuck on top. The haze added to the odd feeling that, seen from the lake, the Rock was nothing to write home about. Go figure. As a final adventure, we drove into the hills above the lake in search of a particular house for sale. We’d heard about it from the owners of a cafe while having coffee in Hendersonville. It was their weekend house but, what with the recession and their busy careers in town, they couldn’t justify the expense of keeping a house they weren’t using enough any more. 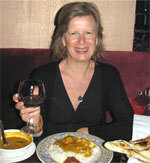 The house was listed with an agent known as “Mr. 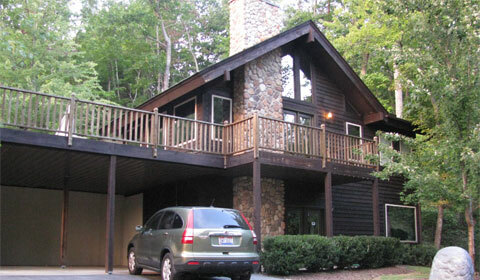 Lake Lure” and was being offered fully furnished, complete with a Billiard Room downstairs. The owners gave us permission to walk around outside and peer in the windows. The price was out of our reach . 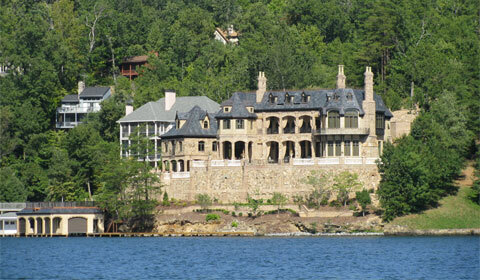 . . but that was our up-close-and-personal Lake Lure luxury dreaming time before heading back to reality. Wow! 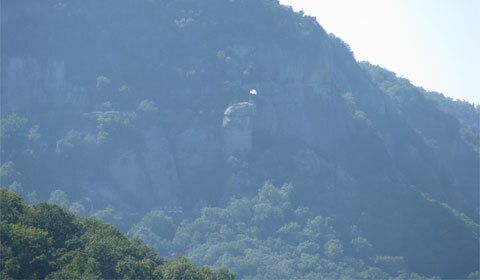 What a great tour of Chimney Rock and Lake Lure….the pictures are beautiful and it sounds like a great destination! 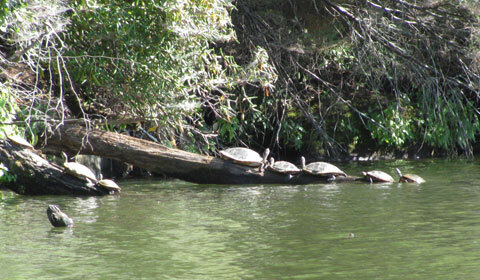 I particularly liked the turtles….thanks for another great travel! This place is beautiful, and my kind of place. Mike and I have always said if we moved south we would like to settle someplace like Asheville N.C. Close enough to drive to the beach for my ocean fix, but still in the mountains, for the green country, I need. Thank you for bringing it to my attention! 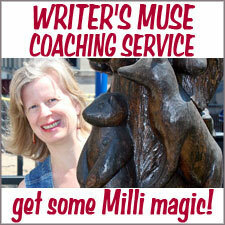 Milli, Thanks for the great post on Lake Lure. We have had our cottage there since 1984. 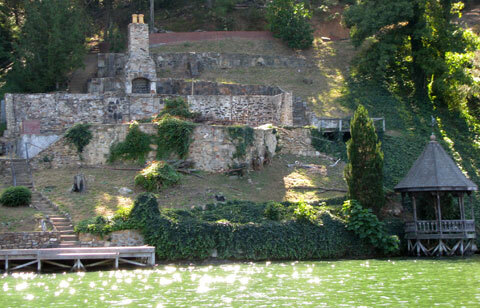 It is right across the lake from the burned down cottage. You did a wonderful job describing our piece of paradise.